Glasgow Warriors' Champions Cup quarter-final with Saracens on Saturday will be "an absolute war", says former Scotland captain Kelly Brown. Brown played for both, winning the Champions Cup twice with Saracens, and expects an intense battle after two feisty clashes in the pool stages. Saracens won 13-3 at Scotstoun, before a 38-19 win in the reverse fixture. "I think it'll be an absolute war out there, it'll be unbelievably physical," Brown told BBC Scotland. "I've got no doubt Glasgow's coaches and players will be using everything they can to try and help them to be successful in the game. "If they feel that they need to physically impose themselves on Saracens, or rattle Saracens, then it's something they'll do." The current English Premiership champions also dispatched Glasgow 38-13 at Allianz Park in the 2017 quarter-finals on their way to winning the trophy. Now an academy coach with the North London club, Brown believes that despite Glasgow's recent poor record they will travel with belief, particularly after Scotland's comeback from 31-0 down against England at Twickenham in the Six Nations earlier this month. "The likes of Adam Hastings, Stuart Hogg and Ali Price - these guys don't suffer from a lack of confidence, so I'm expecting them to come down all guns blazing," said Brown, who spent three seasons at Glasgow before spending the rest of his career at Saracens. "A number of the Scottish players involved in the England v Scotland game will probably be thinking that, if they can impose their game, then they can cause Saracens a few issues." 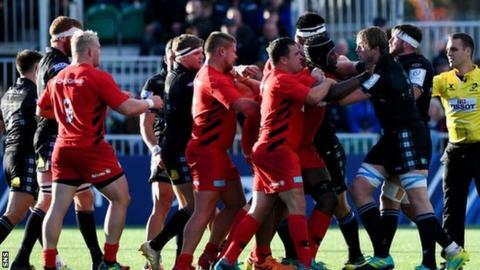 Several players were injured after the Scotstoun meeting in October, and Saracens centre Alex Lozowski was later banned for two weeks for entering a ruck dangerously. There were further flashpoints in the second meeting, and Glasgow head coach Dave Rennie has reportedly suggested Saracens use pushing and shoving as a ploy to influence referees. Brown, though, says any lingering ill-feeling will not be a factor in the result. "There's been a bit of angst in the past, a bit of pushing and shoving because, ultimately, in the modern game, that's all it is," he said.